I was born outside of Detroit in Livonia, Michigan in 1964. My parents moved us across state to Muskegon, where I grew up in a secluded woods, with the sound of Lake Michigan waves breaking on the beach drifting through the tree tops. The mix of wind and waves, sometimes the sound of a far away foghorn from one of the giant lake boats echoing through the woods, are my earliest musical memories. I loved to play in the woods! There weren't many children in my isolated neighborhood, maybe only 4 or 5, around my age, but we would hike over to each other's houses, build forts, have pinecone fights, make ramps and do daredevil jumps with our bikes. Of course in the summer we would spend much of our time climbing the sand dunes at the beach and going swimming. In the winter, the snow would sometimes get so deep that we could build snow forts just by digging into the giant snowdrifts! The elementary school music program started everyone off with recorders, but in the 4th grade we could choose an instrument for the concert band. We were allowed to try everything, but I really liked brass. I didn't even consider the French horn, because my brother and I had been messing around with mother's old French horn for years and it wasn't new or unusual for me anymore. I picked the cornet instead! I didn't switch to the French horn until my Junior High band teacher tricked me into it by offering me a brand new shiny horn to play on. That turned out to be one of the best things that very happened to me. I remember being mesmerized two of my parent's LP records. One was The Temptations and their song "Pappa was a Rolling Stone." I loved the long introduction and build up of the bass line and rhythm leading into the vocals. The other album I listed to a lot was "Jesus Christ Superstar" by Andrew Lloyd Weber. The haunting melodies and powerful rhythms and lyrics really moved me. Melodies from "The Sound of Music" and "The Nutcracker" also played a big role in my musical background. I was a very shy kid, from elementary school though high school. I must have shown some promise in Junior High School, because I began being awarded scholarships to summer music camp. It was there that I started to realize that I had a voice and something to express - and that I could do it through the safety and comfort of my instrument, which turned my "voice" into a loud, strong and beautiful song. I like to make music, to be creative and playful with other people. I like very much to share that fun, beauty and joy with other people. I also like to make loud, powerful noises! Playing brass instruments is the coolest way to make music ever. I like using my voice to perform too, singing and reciting text. I love poetry! I also love to hike in forests, along the beach or in the mountains. I enjoy cooking a lot, and growing plants that make food. I hope that students will have a fun and easy time learning how to play the coolest instruments ever - brass fun for everyone!!! Raised in the coastline woods of western Michigan, Christine Chapman has traveled far and wide to pursue her passion for music. In 1990, after finishing her musical studies at the University of Michigan and Indiana University, she broke out of the rural heartland of America for an orchestra job on the still fresh border between East and West Germany. The desire to gain a bit of work experience before returning to the States has since turned into a quarter of a century of exploration and adventure. 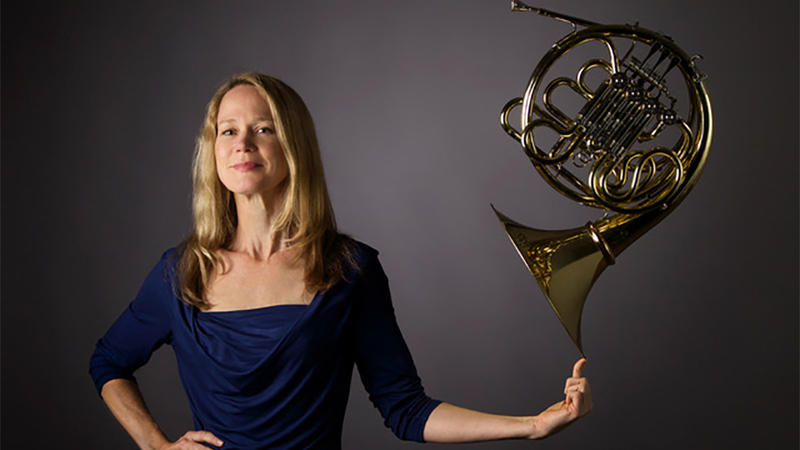 As a member of Ensemble Musikfabrik in Cologne, Germany, Christine Chapman has had the opportunity to collaborate directly with many of today's greatest composers, premiering and performing works by Karlheinz Stockhausen, Wolfgang Rihm, Peter Eötvös, Rebecca Saunders and Georg Friedrich Haas, among others. The experience of performing "outside of the box", such as with the music of Harry Partch, La Monte Young, Sun Ra, or Mouse on Mars, is the main impetus of her work.